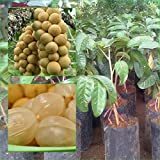 Lanzones growing tree of the genus Lansium also known as Langsat, Lanzones perennial evergreen plant also used as ornamental plant and grow in tropic climate and growing in hardiness zone 13+. Flower color is yellow-green the size 1-3 mm the flowers grow on inflorescence on little stems that connected to trunk or branches like trunk. 1 Thai Longkong grafted Tree Tropical Plant 18" Tall Aglaia dookkoo Lansium Domesticum Direct from Thailand Free Phytosanitary Cert. Yellow-green flower the size 1-3 mm the flowers grow on inflorescence on little stems that connected to trunk or branches like trunk. 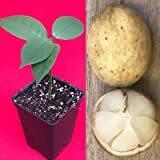 What can be done with big quantities of Lanzones fruits?